Chuzzle Deluxe Game Review - Download and Play Free Version! Match Cute and Fuzzy Chuzzles to Set Them Free! Slide and Match in this Delightful Puzzle Game! Meet the chuzzles: colorful little balls of fur with googly eyes, and the adorable stars of Chuzzle Deluxe! Red, green, yellow, purple, white, orange, light blue, and dark blue - get to know them in all their vibrant splendor. In Chuzzle Deluxe, your goal is to match up three or more of the same color chuzzles next to each other by sliding entire rows and columns in a 6x6 grid of chuzzles. Get three or more chuzzles together in a group and POW! They're gone in a hilarious explosion of fur! Rack up the points with cascading chain reactions and crazy combos of comedy and fun. Fast-Paced, Addictive Gameplay With Wonderful Personality! Chuzzle Deluxe truly stands out not only due to the chuzzles' charm and pizazz, but also due to its completely unique style of play. No other puzzle game is quite like it! The basic game is already wacky and fun enough, but just wait till Chuzzle Deluxe starts throwing curve balls at you! Gigantic chuzzles, rainbow chuzzles, exploding chuzzles, and much more! As you move into higher levels, watch out for locked chuzzles which make it impossible to move the row or column they're in. Classic Chuzzle provides the purest Chuzzle Deluxe experience. Simply play Chuzzle - make matches, avoid getting stuck, and move on to the next level. See how high you can go! In Speed Chuzzle, you are challenged to move quickly and think on your feet, or you'll find your chuzzles getting locked up. Zen Chuzzle is a never-ending marathon where huge chuzzles appear more often once you've reached "Zen" by making a certain number of matches. Finally, Puzzle Chuzzle gives you patterns and the task of moving your chuzzles to match the patterns. With such a wide variety of game modes, Chuzzle Deluxe always keeps you on your toes! A Wonderful Game for All Ages! Kids love the colorful world of Chuzzle Deluxe, where there's never a dull moment. Experienced puzzle gamers appreciate the gameplay and mind workout, and EVERYONE loves the chuzzles! Win lots of cool trophies for specific achievements like creating a seven-step cascade, making a quadruple combo, and exploding three Super Chuzzles at once. Earn all the trophies to unlock secret games! Great Music, Animations, and Sound Effects Make it Even More Fun! Chuzzle Deluxe comes alive with wonderfully fascinating animations. The chuzzles follow your mouse cursor with their big googly eyes, and when you slide them to and fro their fur blows back, responding to air resistance just like it would in real life! They also make cute, squeaky sounds, and the whole game comes with a funky soundtrack full of cool retro sound effects. With four gametypes, addictive and action-packed gameplay, and great game personality, Chuzzle Deluxe is one of the best and most unique puzzle games out there. Go match some chuzzles and download the game now! 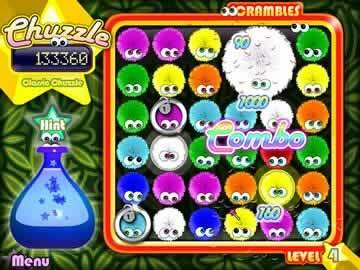 Chuzzle Deluxe is a fun-filled match-three puzzle game that brings something for everyone. The game is simple enough to learn and play, but still provides an array of challenges. Four different modes of gameplay add to the complexity and fun. The Chuzzles, googly-eyed little balls of fur that giggle, add a cute element to Chuzzle Deluxe that makes it great for all ages. Extremely addictive gameplay will get you hooked and keep you playing. 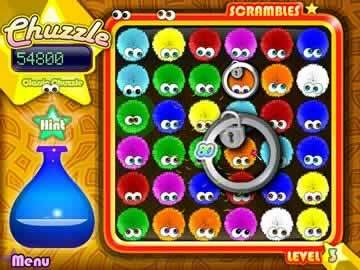 In Chuzzle Deluxe, you have a grid that is full of different colors of Chuzzles. 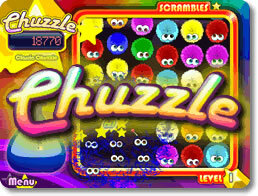 Your objective in each level is to form groups of three or more Chuzzles. As you match the Chuzzles, a flask fills. Once completely filled, you advance to the next level. It sounds simple enough, but the unique gameplay and special Chuzzles can make it very challenging. Rather than switching or swapping Chuzzles (like you do in other match-three games), you move entire rows or columns of Chuzzles at a time. These rows and columns even wrap around the grid, so that dragging a column upward will make a Chuzzle on the top of the grid appear at the bottom. You'll also have to deal with things like exploding Chuzzles, fat Chuzzles that can't wrap around the grid, and locked Chuzzles that prevent the row and column they are in from being moved. While Chuzzle Deluxe does contain levels, there isn't much difference from level to level. All levels are just a random selection and placement of Chuzzles on the game grid (except for Mind Bender Mode). A slightly higher difficulty are the only real changes from level to level. There are four different modes of play available in the game. The Classic Mode is the normal gameplay for Chuzzle (described above). The Speed Mode is similar to Classic Mode, except that you must race against the clock and move as quickly as possible. If you don't make matches quickly enough, a timer will run out and a Chuzzle will become locked. Move too slowly and you might find that so many Chuzzles have become locked that you have no moves left. The Zen Mode is the easiest and most relaxing gameplay experience. There are no timers or locked Chuzzles to deal with, so you can go at your own pace without worrying about running out of moves. The final mode you can choose is the Mind Bender Mode. Each level in this mode has a special pattern that you must match by moving the Chuzzles around the grid. Chuzzle Deluxe does offer two different difficulty settings (Casual and Expert) to choose from, but only for the Classic and Speed Modes. However, even on the Casual setting, the game can still be quite difficult. Fortunately, the Zen Mode provides an option to players who have trouble on the other modes. Zen Mode is a more relaxing and easier experience that novice players can rely on, while others can challenge themselves in any number of ways in the other modes. Additionally, you can always get a hint if you want (in exchange for some points). The controls are few in number and simple in use, much like other match-three puzzle games. You use your mouse cursor to click and drag the Chuzzles in rows, either vertically or horizontally. That's all you need to play the game. Like many other similar matching puzzle games, the graphics in Chuzzle Deluxe are relatively simple. However, the Chuzzles add some personality and a cute element to the game's clean look. Additionally, the simple nature of the game means that not having cutting-edge or over-the-top visuals isn't a big issue. In addition to the graphics, Chuzzle Deluxe puts together a nice collection of sound effects and a good soundtrack to go along with the game. Despite the various modes you can choose from, there isn't a lot of variety in the play. You'll always be moving the rows or columns of Chuzzles regardless of the other slight differences. While this can be a bit repetitive or boring, the game is also very addictive at the same time. The game also tracks high scores and award trophies for play. This encourages you to replay the game and try to earn these trophies or beat previous high scores. Conclusion - Fun + Cute + Well Designed = Chuzzle Rocks! Chuzzle Deluxe is an excellent game choice for players who absolutely love match-three puzzle games, as well as players who have never touched them before. Simple gameplay and controls make it an easy game to learn and enjoy. A variety of modes provide the the perfect experience for players of all skill levels. Cute and colorful presentation adds some personality and makes the game fun for all ages. Chuzzle Deluxe is an addicting entertainment that won't disappoint. Play created video showing basic gameplay and an incredible high score.